If a million monkeys type on a million typewriters for an infinite amount of time, one of them will eventually produce the complete works of Shakespeare. 1. How does the number of monkeys affect the time it takes to produce results? What about the number of typewriters? If there are a million monkeys but only half a million typewriters, will the monkeys using the typewriters type faster, or will they type more slowly in a stubborn display of territoriality? What if there are two million typewriters? 2. Discuss the ethical implications of exploiting monkeys in this manner. Most people would agree that chaining monkeys to typewriters would be unacceptably cruel. Would a setup in which the monkeys are kept in an idyllic monkey preserve, identical to their natural habitat in every way (except for the presence of large numbers of typewriters that they are free to type on or not as they choose) be acceptable? Where do you draw the line? 3. How much typing paper will the monkeys go through each day? Where will this paper come from? Will vast areas of the monkey habitat need to be clear-cut in order to keep up with the demand for paper? Does this affect your answer to question 2? 4. A monkey produces a copy of Hamlet at time T0. A movie about that monkey’s life is released at time T1. A movie depicting a revisionist version of events, in which Hamlet was actually typed by a different monkey (which — spoiler alert! turns out to be a human in a monkey costume), comes out at time T2. Solve for T1 and T2. Extra credit: who plays the monkey in each movie? Who plays the guy in the monkey suit? 5. Is Rise of the Planet of the Apes available on Netflix? Why or why not? 1. Quantum theory tells us that you can’t know the exact position and momentum of an object at the same time. The momentum of an object at rest is 0. What is the momentum of a parked car? Would you entrust your car to a “quantum” valet parking service? 2. Does God play dice with the universe? If so, who usually wins? Alice and Bob own identical bicycles and park them near each other. One night, Charlie secretly switches the front tires on the two bikes. Each night after that, he switches another pair of parts, until the bike parked in Alice’s spot is made entirely of parts that were originally in Bob’s bike, and the bike parked in Bob’s spot is made entirely of parts that were originally in Alice’s bike. 1. Is this really the best practical joke that Charlie can come up with? 2. Giddy with success, Charlie fails to secure the bicycles properly on the last night. An hour after he leaves, one of the bikes falls over. Does it make a sound? 3. Charlie describes his antics to Alice and Bob, who decide to build a storage shed for their bikes in order to prevent people from tampering with them in the future. What color should they paint the bike shed? 4. Alice begins to notice that Bob has been acquiring more and more items — a desk lamp, a chair, several books — identical to things that she owns. Last week, she was surprised to see Bob in line behind her at the supermarket with a cart filled with the exact same groceries she was buying. Should she be concerned? I’ve always thought I was good at Philosophy. Whenever I write a post with science or math in it, I like to check my subscriber stats and see how many people I’ve driven away. One can subscribe to this blog? There’s an RSS feed, and also WordPress has its own subscription mechanism that will either send new posts to you in email or, if you have a WordPress account, display them in the WordPress reader (for some reason, they like the term “follow” better than “subscribe”). Links to these things are on the sidebar on the right. 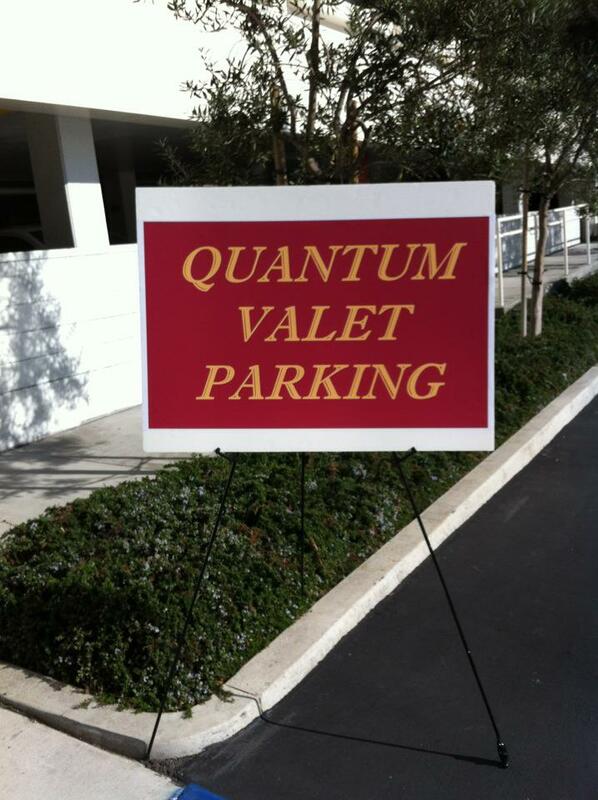 Does Quantum Valet service mean they can move all cars into the same single parking spot, because all they have to do is flip the occasional quantum property here and there? If yes, what kind of car will they get back – is it really the one they gave to the valet, or a super-imposition that includes all cars from clunker to Tesla roadster? Will the quantum effect be limited to the cars parked in that spot, or nefariously branch out into the rest of the parking structure, super-imposingly exchange parts of my regularly monthly parked car with theirs? If their company mascot is a cat in a box, I’m going to report them to PETA. 1 – The number of monkeys is definitely relevant. Some monkeys need to be agents, publishers, editors, critics. It is these monkeys who will push the other monkeys to tighten and hone, revise and renew their manuscripts. Also, time is an illusion. Lunch time doubly so. 2 – Having sat through grade school, high school english, and college level Comparative Literature, it ain’t the monkeys being exploited. 3 – It’s the 21st century. I don’t think even hypothetical monkeys are typing on typewriters. They probably all have their own blogs too. 4 – The solution is X7. Danny Devito, Scarlett Johansenn, Laurence Olivier. 5 – Would anyone watch it if it was? 1 – L, and no. 2 – I believe he plays Craps. 1 – Charlie has been drinking way too much since the Goethe exam and has been hanging out with the Physics students. With that in mind, this is actually a pretty good joke. 2 – Only if Charlie installed a mouth. 4 – Alice discusses it with her friends Ted and Carol. Together with Bob they attend therapy together, which leads to whole different set of issues. Love the Douglas Adams reference. I don’t know whether the monkeys have blogs, but I’m pretty sure they’re all on twitter (“#banana for breakfast — so yummy. maybe i’ll do some #typing”). How long does it take if the monkeys cooperate? If I gave you the answers, that would be cheating. OMG, I love this. All of it. You’re insane. p.s. How long does it take to clean the monkey poop out of the typewriter keys? Because you know all they’re gonna do is fling it at each other. Some is bound to get stuck in places. Good point. And suddenly the cat hair that gets into my keyboard doesn’t seem so bad. OMG, I need to know the answer to the if the bike falls over, does it make a sound question. Where’s the answer key? The monkeys are typing it up. Do you know, Laura, I found myself thinking these very same questions the other morning – what are the chances of that? I didn’t come up with any answers then, either! Really, who doesn’t wonder about these from time to time? Happy Halloween to you too. This is the most entertaining blog I read. There’s a theory in physics that says that whenever a decision is made, multiple universes are created. In one universe, I accept your compliment graciously; in another, I say that you’re obviously reading the wrong blogs. You’ve apparently landed in the universe in which I make a lame physics joke. The answer is pork rinds. That’s your answer to everything, isn’t it? It IS the answer to everything. As someone who hasn’t taken a math class since 11th grade and then majored in communications, I don’t feel capable of even reading this post. No one told me there was going to be a test!! And calling it pop quiz doesn’t exonerate you from the responsibility of at least letting us know that there’s a possibility of a test. Nevertheless, I believe E=MC2 should cover most of it, since quantum theory is a communist plot. This post is brilliant. I cannot answer the questions, but now I feel more probable, more physical and more philosophical. Thank you.